Their band's music comes from the members' love of soul — classic artists James Brown and Sam Cooke — but also the gritty quality heard in more obscure records of that era. Drummer Aaron Frazer says that informed how they recorded: The sessions took place in his basement, where they set up a Tascam four-track, hung up a few bedsheets and got to work. "You don't need a lot of money to make something that sounds beautiful," Frazer says of that moment. "You don't need a lot of know-how to make something that is engaging and authentic. You just need good friends and a karaoke mic." 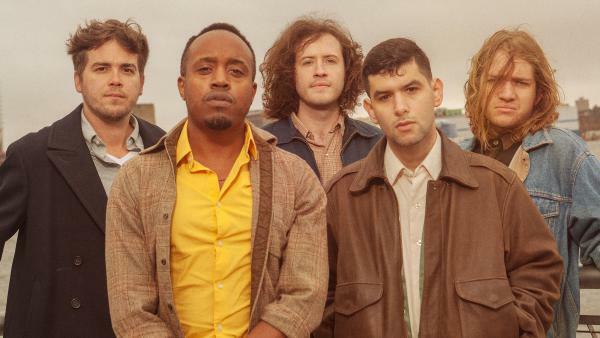 After graduate school, lead singer Durand Jones was applying to military band jobs and hoping to pursue a career in classical saxophone when he hit a speed bump: A friend with whom he'd shared some prescription pills gave them to an undercover cop. "It kind of ruined my chances," Jones says. He transitioned to minimum-wage work, and says those experiences are what's on his mind when he performs the Indications song "Make a Change." "I was just thinking, 'make a change in the world.' But then, it was almost like you got to make a change [as in] cents, dollars," he says. The song "Smile" also took a winding path to its true meaning. The band played Jones a melody and he improvised the lyric, "Ask me how I'm doin' / I smile and say, 'I'm fine.' " As he worked at the words he began to imagine them as an honest answer to the small-talk questions people ask each other every day. "It's a strange quirk of the English language where 'How are you?' can also mean 'Hello,' and people don't expect a response," Frazer says. "We all feel the need to put forward this version of life that is stripped of struggle, but we all have it. And that's OK.
"People have written grand protest songs, grand declarations," he adds. "But it's also nice to pick out a small moment, because I think those can be extra visceral." Durand Jones insists that he is an accidental frontman. DURAND JONES: I never thought that I would be a frontman for some band. You know, I just did this for fun. CORNISH: And it's still fun of course. But what started as a side project with his friends from school is now a real thing with a record contract and tour dates. The band is called Durand Jones & The Indications with Jones joined by guitarist Blake Rhein and drummer Aaron Frazer. We caught up with Jones and Frazer at the South By Southwest music festival in Austin. DURAND JONES AND THE INDICATIONS: (Singing) When I first met you, baby. CORNISH: Their music comes from their love of soul - the classics - James Brown, Sam Cooke. But they also liked the gritty quality they heard from more obscure records from that same era. And drummer Aaron Frazer says that informed how they recorded. AARON FRAZER: We probably spent I think - what was it? - it's like $452. JONES: Somewhere around there. That's beer included, too. FRAZER: Yeah (laughter). We set up the four-track in my house in the basement. There was a washer and dryer. We hung some bed sheets. We used, like, an "American Idol," karaoke machine microphone - just doing things that are beyond what is normally taught as good recording. You don't need a lot of money to make something that sounds beautiful. You don't need a lot of know-how to make something that is engaging and authentic. You just need good friends and a karaoke mic. DURAND JONES AND THE INDICATIONS: (Singing) Make a change. Tell me, tell me what's going on when you see a lady in the streets, single mother with three kids at home. JONES: I was just thinking, make a change in the world. But then it was almost like you got to make a change, like, cents, dollars, you know, like, something so little and not enough. And I finished grad school. And I was applying for the military to do, like, military band jobs or something. And something came up on my record. I remember the day exactly. A friend of mine asked me for some pills that were prescribed to me. And he gave them to an undercover cop. And it kind of, like, ruined my chances as wanting to pursue a career in classical saxophone the way I wanted to. So that kind of forced me to work minimum wage jobs myself. And so I was doing that down in New Orleans for a good bit, working on the side, you know? So to me, in my head, it plays on both of those things. DURAND JONES AND THE INDICATIONS: (Singing) We got to make a change. FRAZER: So often we're divided. But what unites us, I think, is many people's economic situation which cuts across race and religion. So the song, it is also a message to people to unite along those economic lines. And in a time when things are so polarized, so stratified, I think it's an important exercise for people who are creating things to think about the world outside of themselves. DURAND JONES AND THE INDICATIONS: (Singing) Ask me how I'm doing. I smile and say just fine. And there's no need to ask me, brother, what I've been doing to pass the time. JONES: Aaron, Blake and I got together one Sunday night. They played this melody for me that they had. And the words came up to me, ask me how I'm doing. I smile and say just fine. And then Aaron just took the lyric to a whole new level. FRAZER: It took me to a place of thinking about the people who are dealing with struggles in addiction. Substance, too - I've lost friends to heroin - but also people who are addicted to a relationship that's toxic. DURAND JONES AND THE INDICATIONS: (Singing) Late to say I'm sorry with a guilt that I can't stand. Upon your chest, your arms are folded with a bottle in your hand. FRAZER: It's a strange quirk of the English language to where how are you can also mean hello. And people don't expect a response. And we all feel the need to put forward this version of life that is stripped of struggle. But we all have it. And that's OK. It's OK to be outwardly sad and to live in those feelings for a little while instead of feeling the need to suppress them because of some expectation of what you think normal looks like or feels like. You know, people have written grand protest songs, grand declarations. But it's also nice to pick out a small moment because I think those can be extra visceral. DURAND JONES AND THE INDICATIONS: (Singing) To hide my tears, paint on my smile. CORNISH: That was Aaron Frazer and Durand Jones of the band Durand Jones & The Indications. The band is on tour now. DURAND JONES AND THE INDICATIONS: (Singing) Smile and say I'm fine. I saw the cruelness of addiction, saw you fade away with time. Transcript provided by NPR, Copyright NPR.